Every time Whitesnake is mentioned it conjures up many emotions followed by smiles. The lineup of this colossal band has had its share of many artists, and yet the sound has never swayed. Since 1978, David Coverdale, the voice behind the sound of Whitesnake, has delivered heartfelt and stomping hard rock music with each release. Coverdale, at the age of 64, has indicated this year that he sees himself “contemplating retirement.” A year ago he released his twelfth album with Whitesnake, simply titled The Purple Album, that contains remakes from Deep Purple, when he was the frontman of that band. 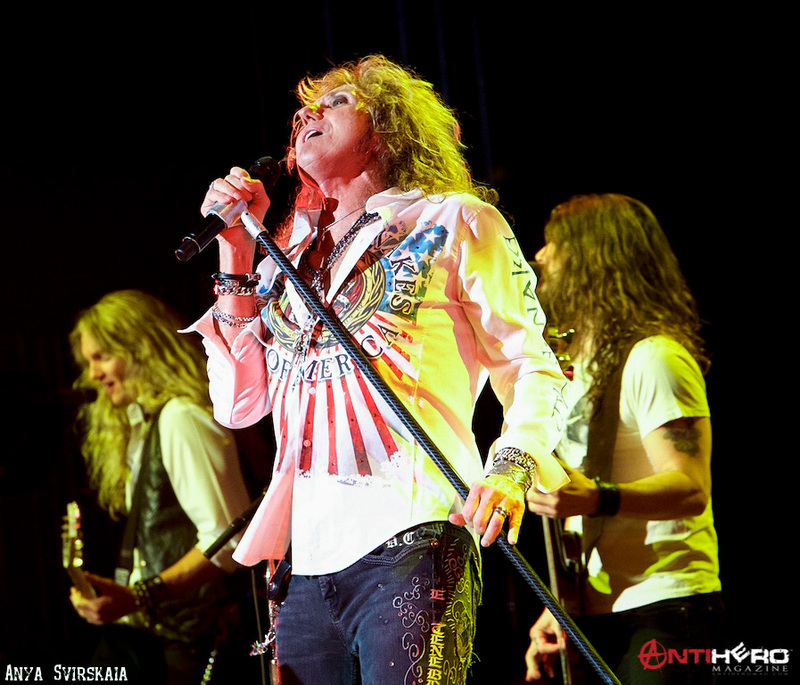 Check out the full photo gallery from the Whitesnake show here! Now he’s on the road doing what some would call a “best of” setlist, which explains why on this Monday night, the place was jammed packed. The New York City audience was a mix of all ages and everyone had a glimmer in their eyes as the house speakers played “My Generation” by The Who. While the crowd danced and sang to the music of The Who, the house lights grew dimmer as the audience got louder. Coverdale took the stage with the commanding presence of a rock god. Immediately, we were reminded of what a true rock vocalist looks and sounds like. He moved and gestured to the crowd going into “Bad Boys” from the 1987 Whitesnake album which sold eight times platinum. Coverdale went into the band’s history by doing songs from another great album, 1984’s Slide It In, performing songs like “Love Ain’t No Stranger,” “Slow and Easy,” and “Slide It In.” Coverdale teased the audience even more with “Deeper the Love” from 1989’s Slip of the Tongue. This song is still considered a hidden classic from an amazing record. Songs like “Fool for Your Loving ’89’” and “Judgement Day” were beautifully done. Oddly though, “Now that You’re Gone” was omitted in this “best of” show. The audience was elated when they performed four more songs from their 1987 self-titled album; “Crying In the Rain” had the men pumping their fist, while “Is this Love?” had the women singing out like a choir. “Give Me All Your Love Tonight” and “Here I Go Again” showed the art of songwriting at its best. As David Coverdale left the stage, the audience did not let up, and the band delivered with an electrifying encore of “Still of the Night.” When the night came to a close it dawned to many that, while Whitesnake delivered the goods, it begs to question, is David Coverdale really going to leave the stage? Hopefully not soon. The band is still on tour, so catch them while you can.